Safety Note: If you have a well that is in a well pit, do not enter the pit until it is well vented and proven safe. Do not work on this alone. A well pit is a dangerous environment that may contain gases that will kill you. If you are unsure of your well pit, call a professional! What should I do if my well quits working? The best thing you can do is shut the power off to the pump until the problem is fixed. Do not pull the pump out because the problem may not be with the pump itself. You can call us and ask for advice. We will help you diagnos the problem over the phone or we can come to your property and advise and repair your system. How do I know where a new well should be drilled? When selecting a new drill site, setbacks need to be considered such as septic fields (50 m), fuel tanks(50 m), natural water courses (100 m), property lines(7.3 m rural) and very importantly, adequate distance from other wells. As part of our safety program, locate all buried lines and facilities by calling Alberta One Call - 1-800-242-3447. Next is the site visit to set a locate stake to mark the drill site. We also consider topography for optimum production and well location - this is something we are very good at and take great pride in. Alberta law states that a landowner can use no more than 750 gallons per day without having to licence their water well. This is an average output of a well over a 24 hour period at a half gallon per minute. Generally, most households use less than 200 gallons per day. I woke up this morning and my well is dry! What happened? As a very strong rule, wells do not go "dry" over night. If this happens during the winter, the chances are pretty good that something is frozen. The pressure switch is usually the first to freeze and then the valves. The system needs to be protected from the elements and kept frost free. Why is the pressure going up and down when I am in the Shower? There is a good chance that the pressure tank is flooded with water and there is not airspace left in it. This situation is very hard on the pumping equipment and needs to be addressed right away. A new pressure tank will need to be installed. 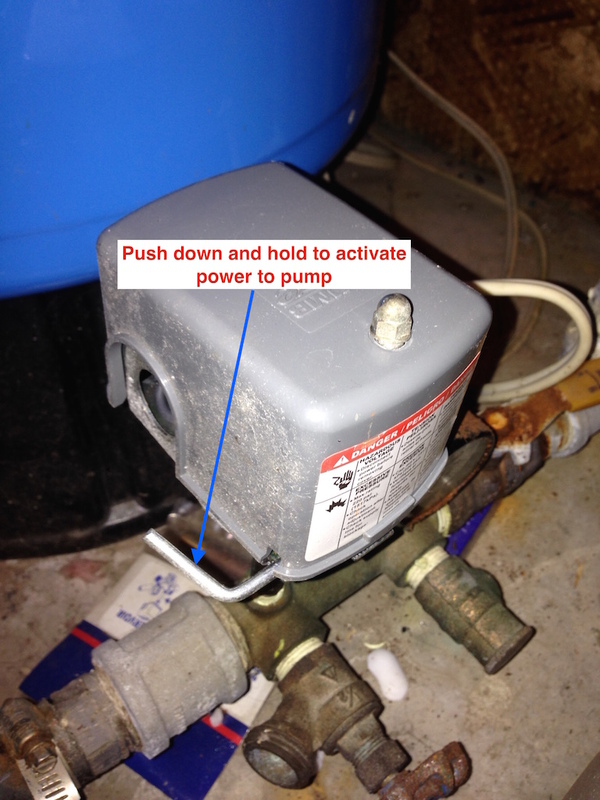 Below shows a newly installed pressure switch installed by a helping neighbor. It needs to be manually activated by pushing down the lever shown until the pressure is above 30 psi in order to operate on its own. When the pressure drops below 30 psi the switch shuts down the pump until it is reset again. If a well owner does not know about the manual reset a uneccessary service call can be expensive. Have a non manual pressure switche installed.